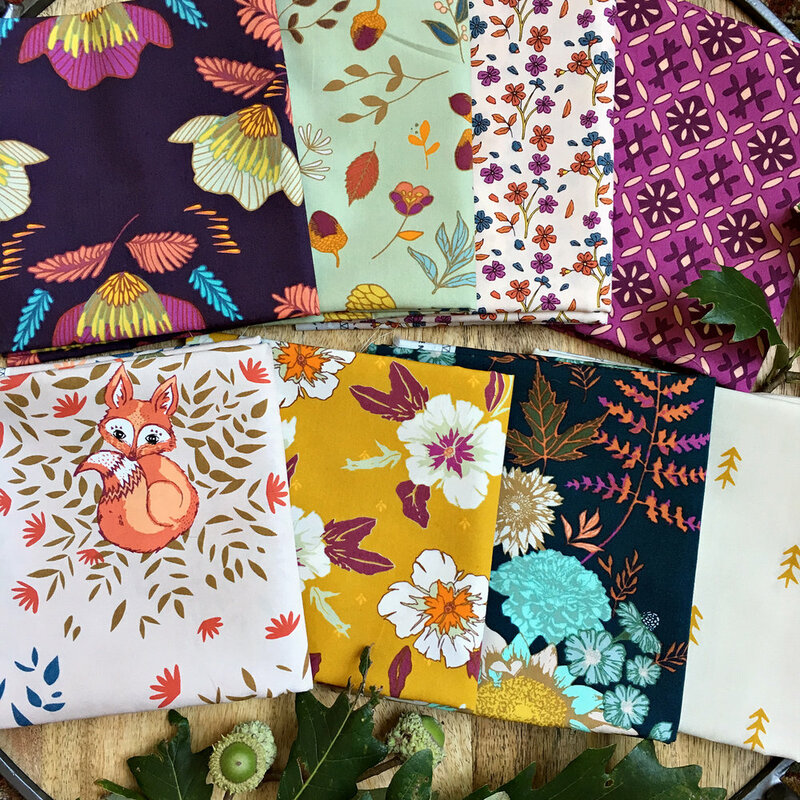 This week the Fat Quarter Shop is offering the Enchanted Love Story Fat Quarter Bundle that includes TEN love-themed, colorful prints designed by my co-host Maureen Cracknell for Art Gallery Fabrics! You can find the Love Story collection in a variety of bundles, as individual prints and quilt kits available HERE at Fat Quarter Shop! Here's how: Since Maureen and I are taking turns hosting the Community Sampler Giveaway Fridays, this week is Maureen's turn so I'm sending you to Maureen Cracknell's blog to enter! Welcome to week #5 of the Community Sampler sew along where we not only work on our patchwork piecing techniques but also share our makes on Instagram and have fun with a like-minded community of quilters. My co-host and sister Art Gallery Fabrics designer Maureen Cracknell and I are so happy to have you sewing with us and look forward to spending the next few months with you. 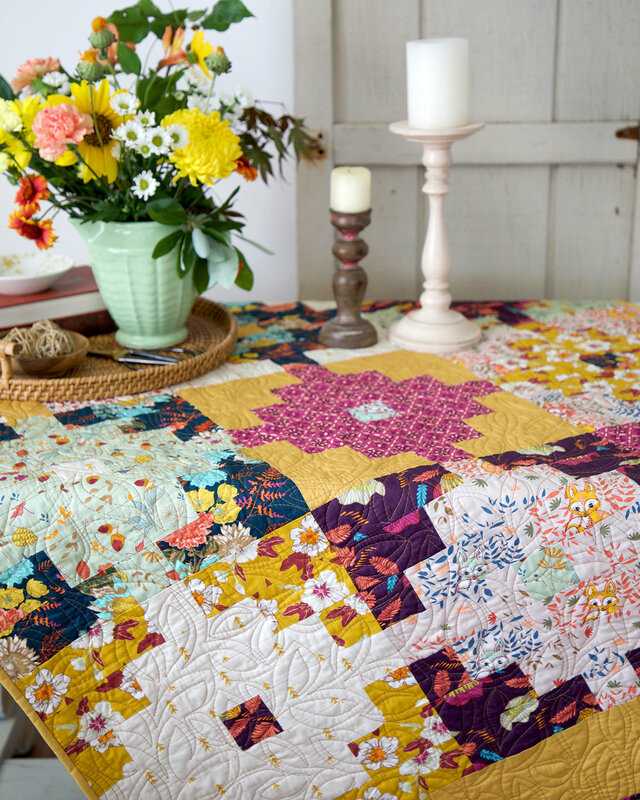 Many of the patchwork units (like Quick-Corner, Flying Geese, Half-Square Triangle, and Square-in-Square units) used in this year's sampler have already been oversized to allow for trimming and squaring of units before assembling your block. Please cut your pieces EXACTLY as given in each of the PDF instructions because bumping up the size of the pieces from the measurements give will not bring great results in some cases--especially in this week's block. Cut carefully and as stated in the instructions. Take advantage of my in-blog tutorials for each of the different quilting techniques used in our sampler. Let's start sewing the Cactus block. Here we make two, half-blocks that fill positions 4 and 5 in our quilt. Download the free PDF on the Sew Along page. The success of this block rest solely in your ability to cut and sew accurately. You'll be put to the test here and hopefully rewarded for your efforts. If you're wanting to use directional prints for either the HST units or the rectangle units you may want to check out my tutorial for controlling directional prints that was posted during the Sewcial Bee Sampler sew along. Cut your A and B pieces exactly as stated in the instructions. Yes, that means a true 7/8" on the end of those cut size numbers. The reason we are using a 7/8'' measurement rather than rounding up to the nearest full number is we are cutting our pieces on the diagonal and creating our necessary 1/4" seam allowance on our pieces and not trimming down when done. Draw a diagonal line on the wrong side of each 2-1/2" fabric A square. Noting orientation of the drawn line, place a marked square right sides together on a corner of a 2-1/2" x 6-7/8" fabric B rectangle as shown in the instructions. Sew just outside the line (a needles worth) to keep the unit square. Trim 1/4" past the sewn line (like we've done in making other types of units). Press toward the darkest fabric. Note that I've rotated my pieced rectangle so I can align the 45° mark on my ruler with the long edge of my rectangle. Rulers vary for where these additional markings are placed and you will have to flip your ruler around a bit to get the 45° angle aligned to a long edge according to your ruler and if you're right or left handed. Noting orientation of the seam and using the straight edges and 45° marking on a ruler, cut the opposite end of the rectangle diagonally, creating an angled end parallel (running the same direction) to the stitch line. Cut diagonally from the corner point of the rectangle on a 45° angle. This makes one A/B rectangle unit that measures 2-1/2" x 6-7/8". Make a total of four in this orientation. In the same manner as in the steps above, and noting the orientation of the drawn line and parallel diagonal edge cut, make a total of four A/C rectangle units. Press seams toward the dark fabric. Notice how I've rotated my rectangle and aligned the 45° marking on my ruler on the long edge of the unit. These are just two different rulers but the results are the same, rulers can vary for where they've included these extra markings. Just make sure the diagonal cut is parallel (running the same direction) to the stitch line and cut from the corner point of the rectangle on a 45° angle. Sew a large fabric A triangle (a 4-7/8" squares that's previously been cut in half diagonally to make two HST shapes) to a A/B rectangle unit to make a quarter section. Use the shorter of the two long edges and square short end of the rectangle to align the large triangle, right sides together. Notice how the tip of the large triangle extends past the rectangle unit. The seam line will enter right in the "V" of these two pieces. Press toward the dark fabric. Repeat with the mirror image A/C rectangle unit and large fabric D triangle. Sew the two quarter sections together to make one half block. Make a total of two half blocks. I believe the success of this block comes first from good piecing and second from upping the contrast a bit so each shape can stand out. In my block there's obvious light and dark fabrics and they stand out in the solids. By always press toward the dark fabric I was assured my seams would nest when it came time to piece and this locking in of the seams made the points nice and sharp. It's unavoidable that the longest edge of our half blocks are bias edges. Normally these two half blocks would be sewn together into one block but for our quilt layout we need three half blocks. You may want to starch this block if you think it will get a lot of handling between now and the time the block is sewn into a top. Just take care not to stretch or vigorously press this block to avoid distortion. You can see how this would make a beautiful full block and I have already designed a baby quilt using this block from my new spring collection for Art Gallery Fabrics (coming in May, so be watching soon for spring Market reveals). For my sampler, I'm using Art Gallery Fabrics Pure Element solids and when it came time to photograph this block I happened to have this vintage quilt nearby and realized how the green backing of this quilt almost matches the Pistachio Creme green (PE-462) of the AGF solids! Don't forget that this Friday's a Giveaway Friday on the Community Sampler sew along. Maureen and I will take turns hosting a giveaway each week where one of our generous sponsors will be featured and offering amazing prizes both here on our blogs and a second chance on Instagram. Maureen will be hosting the giveaway this Friday and you'll be instructed how to enter at that time.